Stainless Works Rod Builder Custom Exhaust Kit, 3-1/2" Dia. Rod Builder Custom Exhaust Kit, 3-1/2'' Dia. Stainless Works has made it a lot easier for you to build your own custom exhaust system. Rod Builder Kits feature all mil spec certified 304 stainless steel mandrel bent tubing. Each kit comes with enough pieces to build any style exhaust you desire. Kits are available with one end of each piece is expanded to a slip fit for ease of installation. 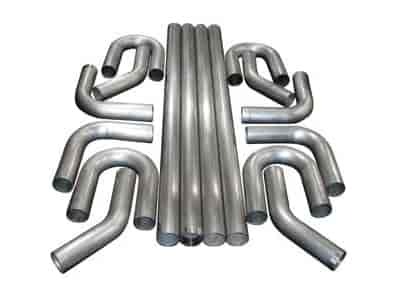 These kits come in all popular exhaust tubing sizes and come standard with the following: four 180° bends, four 90° bends, four 45° bends and four straight pieces. Bends and tubing can be either mig or tig welded with S/S Wire, although tig welding is recommended for a clean, neat appearance. .
JEGS 30804 - Sure Seal 3-1/2" Clamp Fits 3.580" to 3.780"